… three incredibly friendly ladies. Each had her own fascinating adventure story. I was so excited to meet them that I drove more than an hour to see them. I also sacrificed a traditional annual event that I usually attend with several friends, because both events were held at the exact same time. Was it worth it? Let me put it this way: I’m still beaming nearly 24 hours later! Of course, it’s baseball related. In fact, it’s related to professional baseball. Although reading my words won’t do any of them justice, allow me to introduce them to you. Betty Cook was not on yesterday’s agenda, yet she and I enjoyed a wonderful conversation regarding Christy Mathewson. 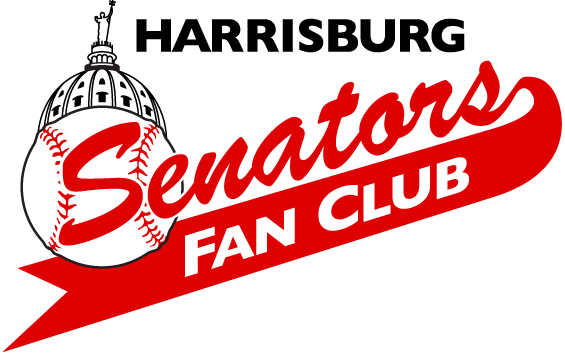 Her cousin, Jack Fisher, will be our guest speaker at the next meeting of the Harrisburg Senators Fan Club. Jack will present information about this Hall of Fame pitcher from Central PA that we won’t find published in any book or online. He’s gained this insider knowledge because of his cousin, Betty Cook. Betty was so close with the Mathewson family that she represented them in Cooperstown from 1955-1984. During these induction weekends, Betty met the likes of Ty Cobb, Joe DiMaggio and other household names with plaques in the Hall of Fame. If Betty is able to travel, she would like to join Jack at our next meeting Tuesday, September 20th at 6:30 at American Legion Post #143, 214 Market Street, New Cumberland. You will not be disappointed. She is a lovely lady and extremely knowledgeable. Sarah Jane “Salty” Sands Ferguson left Orangeville, PA when she was 17 to play professional baseball for the Rockford Peaches. If you’re unfamiliar with the All-American Girls Professional Baseball Association, think “A League of Their Own”. Salty played two years as a catcher/right fielder before the league disbanded. Joanne McComb was the best utility infielder in the traveling league. She left Avonmore, PA right out of high school and played for the Springfield Sallies. Joanne’s team and another team traveled and played pro baseball through many states and Canada. Both Salty and Joanne were invited to Cooperstown to appear in the league reunion scenes in “A League of Their Own”. Both told very entertaining stories about how their love of baseball transformed their lives. I don’t want to reveal too much about their stories, because you must hear them deliver their own words to truly appreciate their gifts. All three ladies are treasures to behold. None used a single note, yet they all conversed with us using incredible detail and facts. If I learn of another opportunity for us to meet Salty and Joanne, I promise to help publicize the event. Yesterday, all three ladies transformed a rural public library near Lewisburg, PA into a theater of baseball enjoyment. I thank them all for their warm hospitality and friendly banter. They treated all of us attending the event as they would their own families. Salty, Betty and Joanne with your humble blogger. I thank Jack for inviting me and look forward to seeing him again on the 20th. Thanks, too, to my baseball/history buff friend, Terry Hartzell, for accompanying me on yesterday’s journey. Terry and I also took time to visit the “Memorial Gateway” at Bucknell University’s football stadium (dedicated to Christy Mathewson) and the grave site of Christy and his family at Lewisburg Cemetery just off campus.